Review: Never in life is the imagination as strong as it is in a child - particularly in a 3rd grade boy named Andrew North. Adam Selzer has written a work of comic genius in his newest children's book Andrew North Blows Up the World. The focus of the story is on a young boy who idolizes his older brother to the point that he honestly believes everything he says. His brother has concocted an entire story about how he and their father are spies - and very secret spies at that! They belong to a secret organization of spies, and it is Andrew's goal to become a member of that group. He steals a graphing calculator from his brother's room - knowing that it's not really a calculator, but rather it's a way to communicate with the spy headquarters and ultimately has the power to blow up the world. 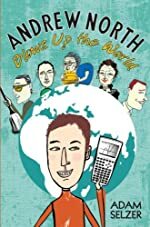 Chaos hits when the calculator/communicator is taken away during math class and given to the janitor (whom Andrew believes to be an evil spy) to be placed in the most secretive room in the entire school. Can Andrew retrieve the calculator without being caught and killed? Will Andrew ever be able to prove that he's worthy of becoming a spy? And, will Andrew make it through singing a solo in a concert in a ridiculous sweater - knowing all along that the head of the spy group is watching him? Andrew’s antics make for a fantastically funny adventure. Selzer has struck gold with Andrew North Blows Up the World. Andrew represents a little of everyone's inner child. He's gullible beyond belief, but honestly believes he's not! For example Andrew's analysis of how he's different from gullible people is, "Personally, I only believe stuff when I've thought it over and decided it really makes sense. Like when my brother, Jack, told me that our dad is a spy and that he was training to be one, too, I didn't believe him at first. . . . What really tipped me off was his [dad's] job. He tells people - including me - that he's an insurance salesman. But he can't even talk me into eating peas! How could he talk people into buying life insurance?" The entire book is filled with humor such as this. Plus, every chapter begins with a page that sounds like it's right out of a spy journal. "Secret Agent Andrew 'Danger' North moved like a cat through the Forbidden Zone." The reader can easily imagine the dark serious voice reading these sections in a mysterious fashion. Selzer's writing style is such that young readers will giggle and anxiously turn the pages to see what happens next, and older readers will knowingly laugh at the over enthusiastic, highly confident boy with the most bizarre, yet innocent interpretations of everyday life. What makes children's literature an excellent work of fiction? It's the ability to transcend generations. Anyone who picks up this book will put it down with a smile on their face - regardless of age. That's an excellent book. Hopefully Andrew North with not stop here. The character is so well developed that it would be a shame to have this be his last spy mission. Hopefully one day there will be a collection of Andrew North novels. Andrew North just may be the perfect book to get that young reluctant reader excited about literature! Review written by Margo Nauert (6th grade teacher). We would like to thank Random House for providing a copy of Andrew North Blows Up the World for this review. Have you read Andrew North Blows Up the World? How would you rate it? What a great review! So glad you included snippets of the book in your review; had to chuckle over the lines about Andrew's Dad. This book sounds like a great stocking stuffer for readers of all ages.